A Polish-British team of physicists has constructed and tested a compact, efficient converter capable of modifying the quantum properties of individual photons. The new device should facilitate the construction of complex quantum computers, and in the future may become an important element in global quantum networks, the successors of today's Internet. Quantum internet and hybrid quantum computers, built out of subsystems that operate by means of various physical phenomena, are now becoming more than just the stuff of imagination. In an article just published in the prestigious journal Nature Photonics, physicists from the University of Warsaw's Faculty of Physics (FUW) and the University of Oxford have unveiled a key element of such systems: an electro-optical device that enables the properties of individual photons to be modified. Unlike existing laboratory constructions, this new device works with previously unattainable efficiency and is at the same time stable, reliable, and compact. Building an efficient device for modifying the quantum state of individual photons was an exceptionally challenging task, given the fundamental differences between classical and quantum computing. Contemporary computing systems are based on the processing of groups of bits, each of which is in a specific, well-known state: either 0 or 1. Groups of such bits are continually being transferred both between different subcomponents within a single computer, and between different computers on the network. We can illustrate this figuratively by imagining a situation in which trays of coins are being moved from place to place, with each coin laying either with the heads side or the tails side facing upwards. Things are more complicated in quantum computing, which relies on the phenomenon of superposition of states. A quantum bit, known as a qubit, can be both in the 1 state and the 0 state at the same time. To continue the analogy described above, this would be like a situation in which each coin is spinning on its edge. Information processing can be described as "quantum" processing as long as this superposition of states can be retained during all operations - in other words, as long as none of the coins gets tipped out of the spinning state while the tray is being moved. "In recent years, physicists have figured out how to generate light pulses with a specific wavelength or polarization, consisting of a single quantum -- or excitation -- of the electromagnetic field. And so today we know how to generate precisely whatever kind of quantum 'spinning coins' we want," says Dr. Michal Karpinski from the Institute of Experimental Physics (FUW), one of the authors of the publication. "But achieving one thing always leaves you wanting more! If we now have individual light quanta with specific properties, it would be useful to modify those properties. 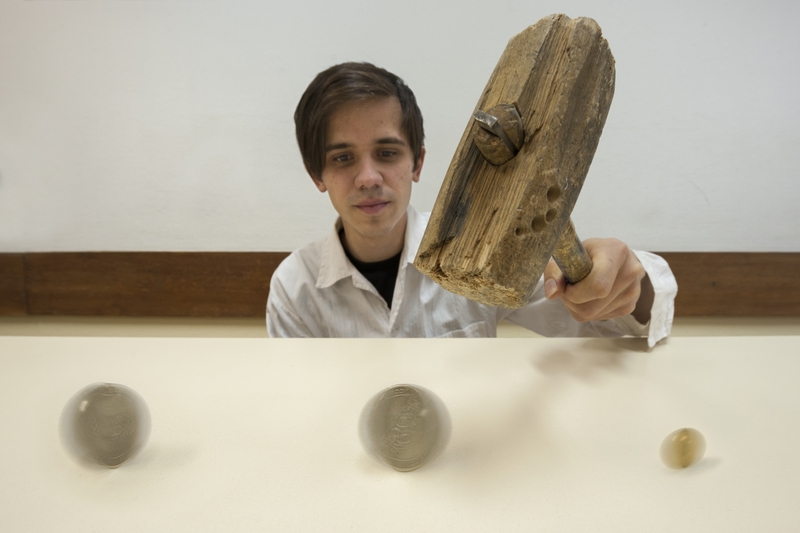 The task is therefore more or less this: take a spinning silver coin and move it from one place to another, but along the way quickly and precisely turn it into a gold coin, naturally without tipping it over. You can easily see that the problem is nontrivial." Existing methods of modifying individual photons have utilized nonlinear optical techniques, in practice attempting to force an individual photon to interact with a very strong optical pump beam. Whether the photon so subjected actually gets modified is a matter of pure chance. Moreover, the scattering of the pump beam may contaminate the stream of individual photons. In constructing the new device, the group from the University of Warsaw and the University of Oxford decided to make use of a different physical phenomenon: the electro-optic effect occurring in certain crystals. It provides a way to alter the index of refraction for light in the crystal - by varying the intensity of an external magnetic force that is applied to it (in other words, without introducing any additional photons!). "It is quite astounding that in order to modify the quantum properties of individual photons, we can successfully apply techniques very similar to those used in standard fiber-optic telecommunications," Dr. Karpinski says. Using the new device, the researchers managed - without disrupting the quantum superposition! -- to achieve a six-fold lengthening of the duration of a single-photon pulse, which automatically means a narrowing of its spectrum. What is particularly important is that the whole operation was carried out while preserving very high conversion efficiency. Existing converters have operated only under laboratory conditions and were only able to modify one in several tens of photons. The new device works with efficiency in excess of 30%, up to even 200 times better than certain existing solutions, while retaining a low level of noise. "In essence we process every photon entering the crystal. 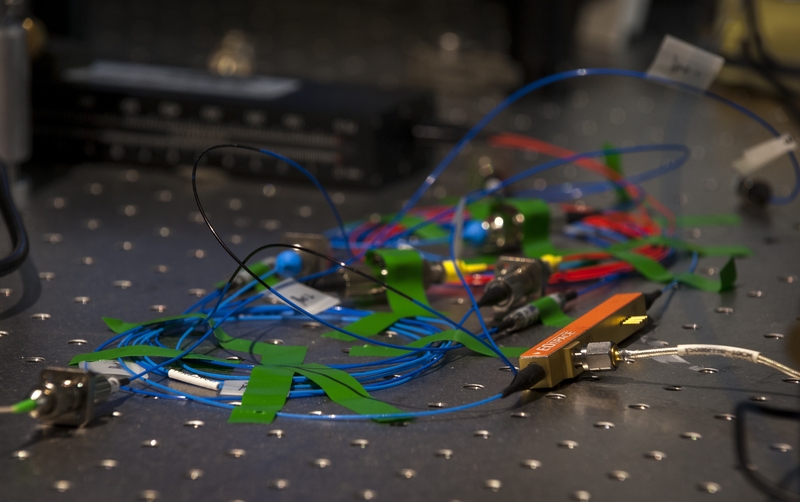 The efficiency is less than 100% not because of the physics of the phenomenon, but on account of hard-to-avoid losses of a purely technical nature, appearing for instance when light enters of exits optical fibers," explains PhD student Michal Jachura (FUW). The new converter is not only efficient and low-noise, but also stable and compact: the device can be contained in a box with dimension not much larger than 10 cm (4 in. 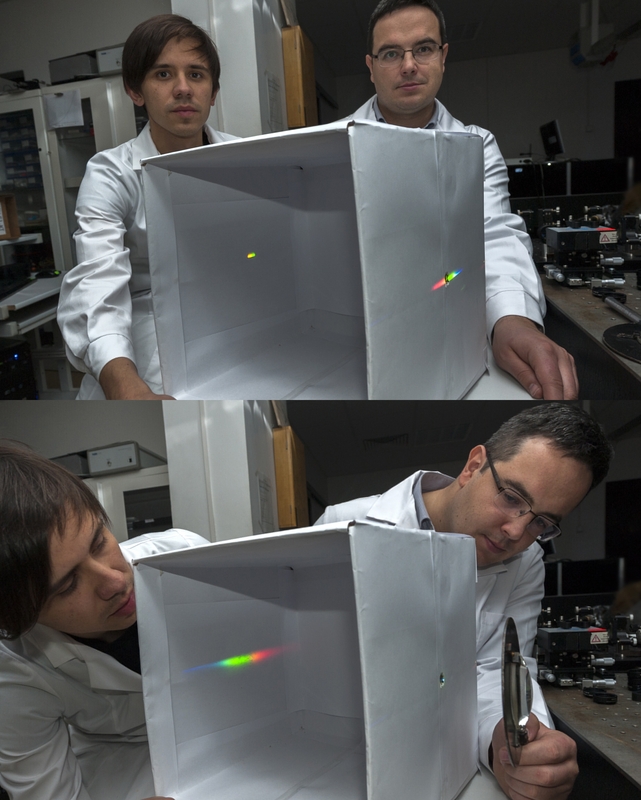 ), easy to install in an optical fiber system channeling individual photons. Such a device enables us to think realistically about building, for instance, a hybrid quantum computer, the individual subcomponents of which would process information a quantum way using different physical platforms and phenomena. At present, attempts are being made to build quantum computers using, among others, trapped ions, electron spins in diamond, quantum dots, superconducting electric circuits, and atomic clouds. Each such system interacts with light of different properties, which in practice rules out optical transmission of quantum information between different systems. The new converter, on the other hand, can efficiently transform single-photon pulses of light compatible with one system into pulses compatible with another. Scientists are therefore gaining at a real pathway to building quantum networks, both small ones within a single quantum computer (or subcomponent thereof), and global ones providing a way to send data completely securely between quantum computers situated in different parts of the world. The experimental part of this work was carried out at the University of Oxford's Department of Physics, in the Optical Quantum Technologies Group led by Dr. Brian J. Smith, where Dr. Karpi?ski had held a postdoctoral fellowship under the prestigious Marie Sklodowska-Curie grants. On the Polish side, the work was funded by grants from Poland's National Science Centre and the 7th EU Framework Programme. Physics and Astronomy first appeared at the University of Warsaw in 1816, under the then Faculty of Philosophy. In 1825 the Astronomical Observatory was established. Currently, the Faculty of Physics' Institutes include Experimental Physics, Theoretical Physics, Geophysics, Department of Mathematical Methods and an Astronomical Observatory. Research covers almost all areas of modern physics, on scales from the quantum to the cosmological. The Faculty's research and teaching staff includes ca. 200 university teachers, of which 88 are employees with the title of professor. The Faculty of Physics, University of Warsaw, is attended by ca. 1000 students and more than 170 doctoral students. Faculty of Physics, University of Warsaw. Division of Optics, Institute of Experimental Physics, Faculty of Physics, University of Warsaw. Press office of the Faculty of Physics, University of Warsaw.